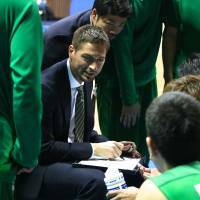 The Tokyo Excellence, who are in their first season in the National Basketball Development League (formerly the JBL2), have posted a splendid 29-3 record to date. The club is aiming to win the championship in the four-team playoffs this weekend. 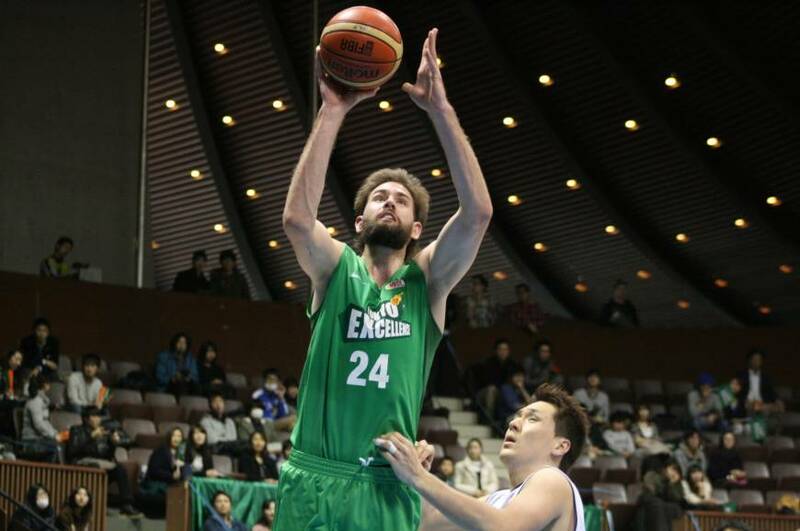 Tokyo’s main weapons are a pair of Americans, center Joe Wolfinger (211 cm) and center/forward Markhuri Sanders (200 cm). Wolfinger was third in scoring (23.0 points) and fourth in rebounding (13.5) in the league, while Sanders was first in rebounding (15.2) and second in field-goal percentage (57.3). Veteran point guard Satoshi Miyata led the league in assists (4.7) and was third in steals (1.8). Also, the Excellence excelled on defense. They gave up the fewest points per game (62.28) in the nine-team NBDL. They were the only club that went unbeaten at home (19-0). 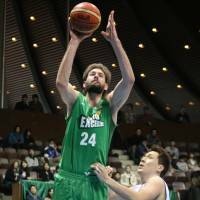 In the playoffs, which will be held at Himaraya Arena in Gifu, the Excellence will face the Aisin AW Areions (20-12) in a one-game semifinal series. If they win it, then they’ll battle for the title against the winner of the other semifinal clash between Toyota Tsusho and the TGI D-Rise (17-15) in Sunday’s final. All three of Tokyo’s three losses have come against Toyota Tsusho. 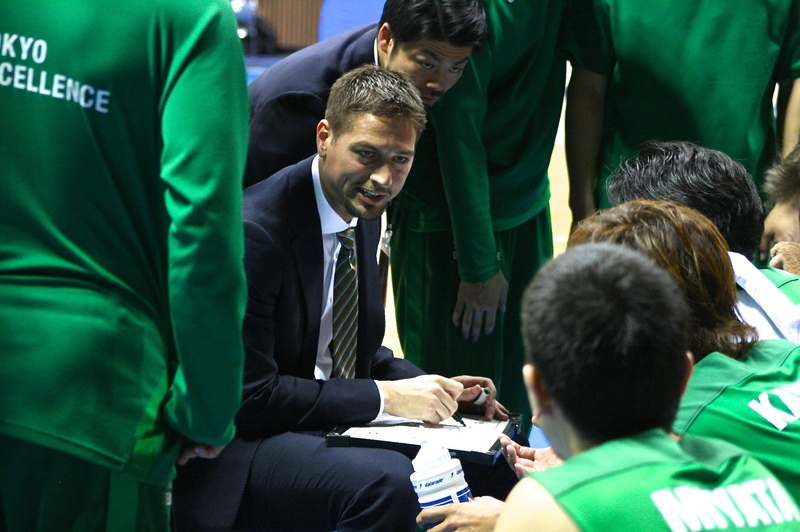 Olson, a 34-year-old Portland, Oregon native, confidently said that his team could compete in the top league, the NBL. “Of course, (but) it takes a little bit of time to get better and experienced in the NBL,” he said. Before the 2013-14 campaign, the Excellence played several preseason games, official and unofficial, including a pair of contests against bj-league teams (Tokyo beat the Yokohama B-Corsairs 91-61), a few games against NBL teams, a game against a collegiate team and a game against the Korean Basketball League’s Anyang KGC (the Excellence lost 66-55). In the games against NBL teams, it appears that the Excellence fared well enough. It makes you think that, at the very least, Tokyo could play better than some of the league’s weaker teams. But the transition to the NBL isn’t easy, primarily because of financial concerns. Having enough money to run a team is a tough challenge for most of Japan’s clubs, no matter which league they compete in. That is why Tokyo won’t rush to make a decision too quickly. “I definitely think that way,” Olson said, when asked if he thought that the Tokyo teams have faced hard times because there are other attractions nearby. “In Shibuya, there are so many things to do,” he said with a laugh. Tsuji agreed that the team must first look to lay a foundation so it can eventually gain recognition. Once it’s achieved that to some degree, then the club will be ready to perform at a higher level, he added. The Japan Basketball Association has recently announced that it would establish a new professional league for the 2016-17 season. For the Excellence, that’s a suitable timetable to make another fresh start. “We are currently shooting for 2016, when the new pro league starts,” Tsuji said.